Summer time is usually a slow season for a weekend wildlife photographer like me. This is what we’re referring rainy days to when we were asked why we did not post all the pictures taken from an outing and we just replied we’re saving for the raining days. Time to revisit my HDD vault to see if there are any interesting enough shots that can be shared. 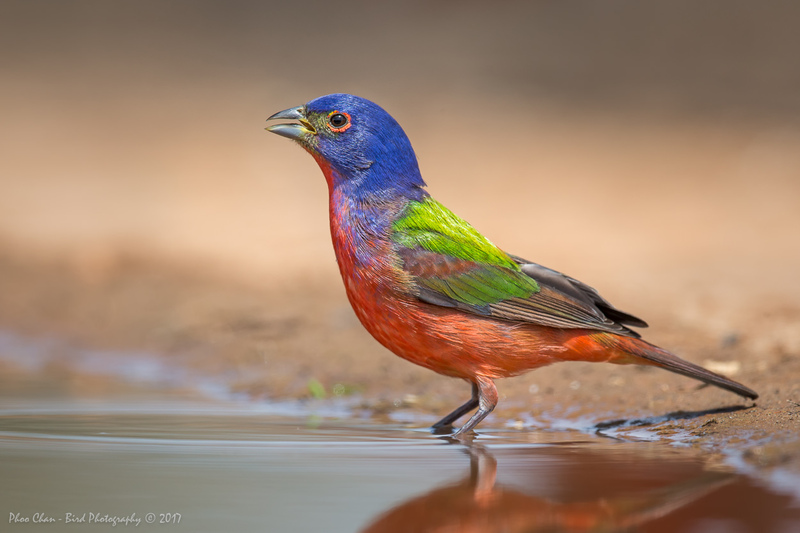 My buddy Conrad Tan has posted an article about this trip on Fred Miranda before, but since this is one of many great trips we made over the years, it doesn’t hurt to have a rerun. I have to thank him for letting me use some of the pointers. 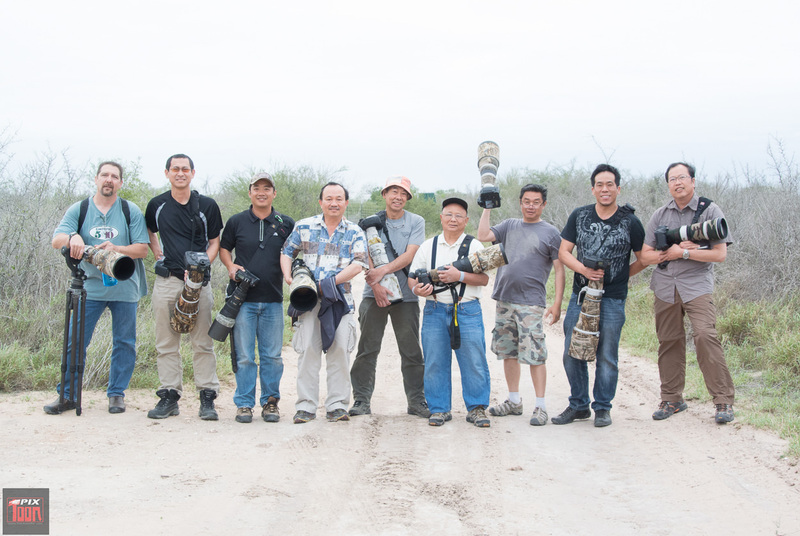 Three years ago in May, I made a weekend shooting trip along with my close birding buddies Conrad Tan, Thinh Bui, AnhTuan aka ToonPix (most of people’s pictures posted here are courtesy of ToonPix), Tan Huynh, Khai Nguyen, Hai Ta at one of the best bird photography ranches in South Texas. 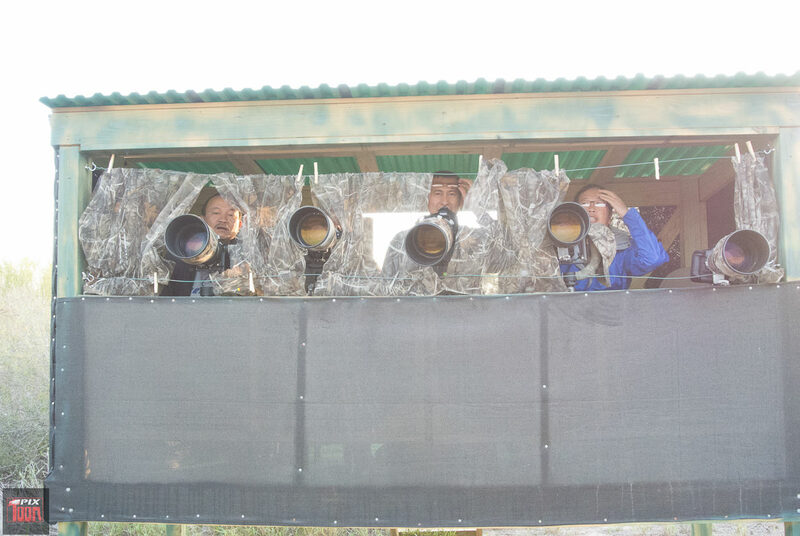 We’ve heard about all the good shooting there by all the big name pros, so as usual our dedicated team organizer, Thinh Bui took the liberty and contacted one of these places. Before we knew it, our tickets were bought and off we went. We were lucky to collect our baggage on time and got out of the McAllen International Airport 5 minutes before the whole airport was placed in a lockdown when a man was reported to have shot himself with a gun. 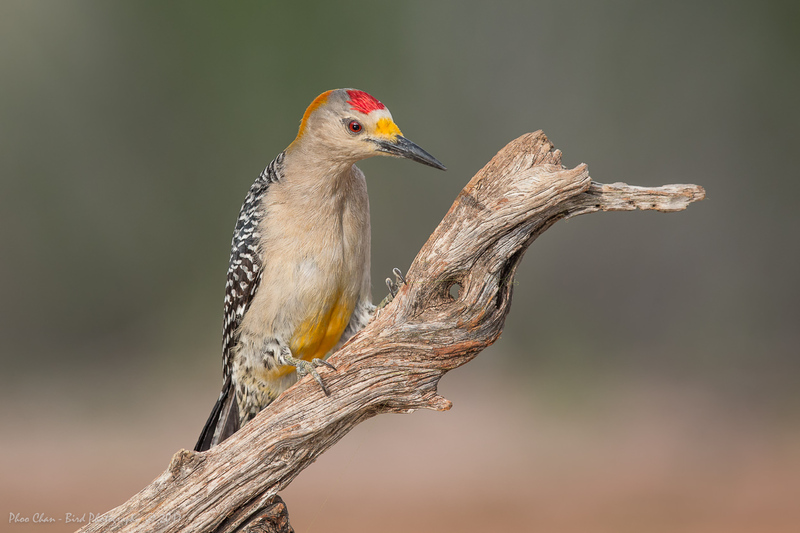 This could have been a whole subject by itself but I’m not going to get into it and I’ll stick to my subject of our feathered The 4-bedroom guest house was conveniently located right smack inside the ranch which which could accommodate up to 8 visiting photographers very comfortably. So instead of having to drive 40 miles out to the nearest hotel, you can make full use of the facility specially if your group size is as big as ours. It has a fully equipped kitchen with built-in central heat and air condition. We really enjoyed the barbecue pit since we’re a bunch of meatatarians. The following two paragraphs are actually taken from Conrad’s original post on Fred Miranda which provides a brief but concise introduction about the place. Located in the Rio Grande Valley of southern Texas, nine miles west of McCook lies the Santa Clara Ranch. 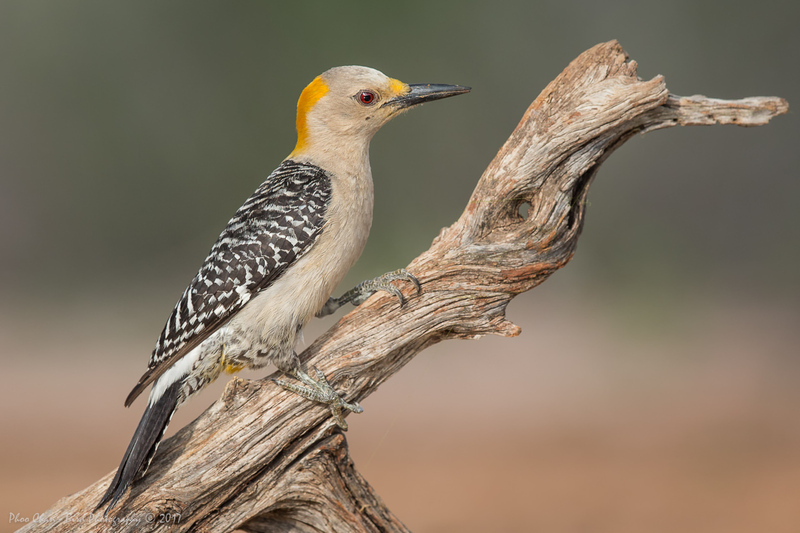 Owned and operated by Dr. Beto Gutierrez this 300 acre wildlife sanctuary, even though quite small compared to Texas standard is comprised entirely of virgin brush land. 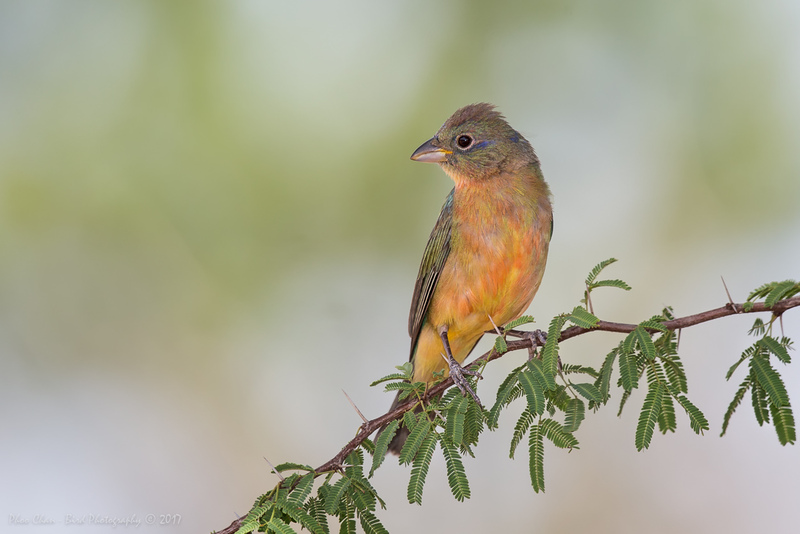 The Santa Clara Ranch is part of a growing group of land holdings owned by forward thinking landowners in the lower Rio Grande Valley who have realized the importance of creating and preserving natural habitat for wildlife over the past three decades. Their tireless efforts have resulted in the return of many native species to their lands, some of which are found nowhere else on earth. 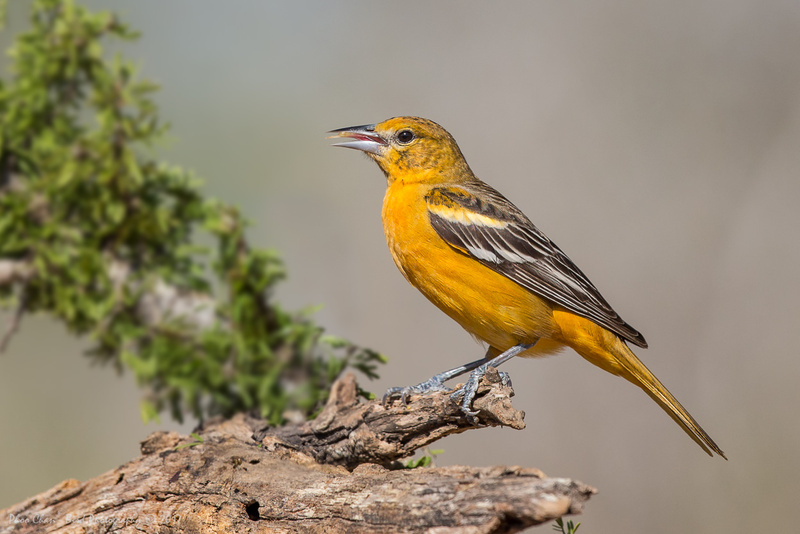 This has developed an increased interest in the area and its wildlife, as well as the opportunity to view an amazing amount of migratory song birds during their annual spring migration. This type of photography is not for everyone. 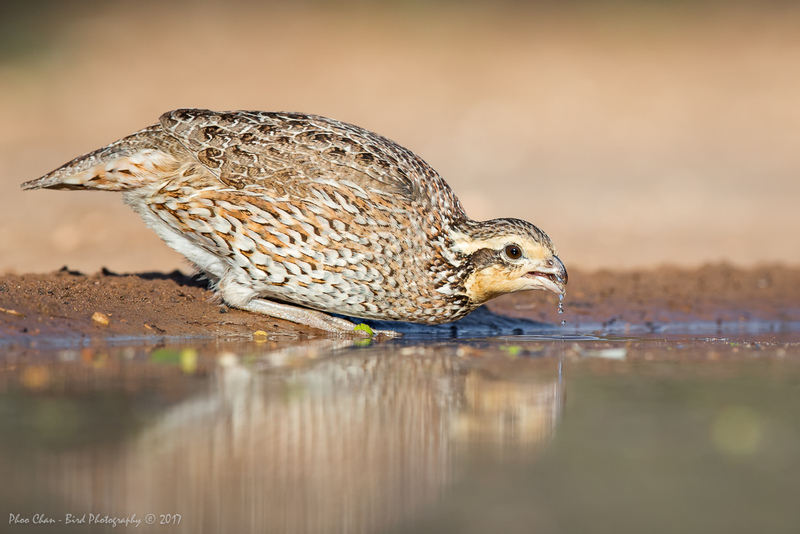 The birds and wildlife are drawn in by water-pools especially created in front of bunkers that provide the best possible photographic angle to thirsty critters that come in for water. It couldn’t be easier! The opportunities of getting just about anything is so great, you’ll not know what camera/lens to hold in your hand. 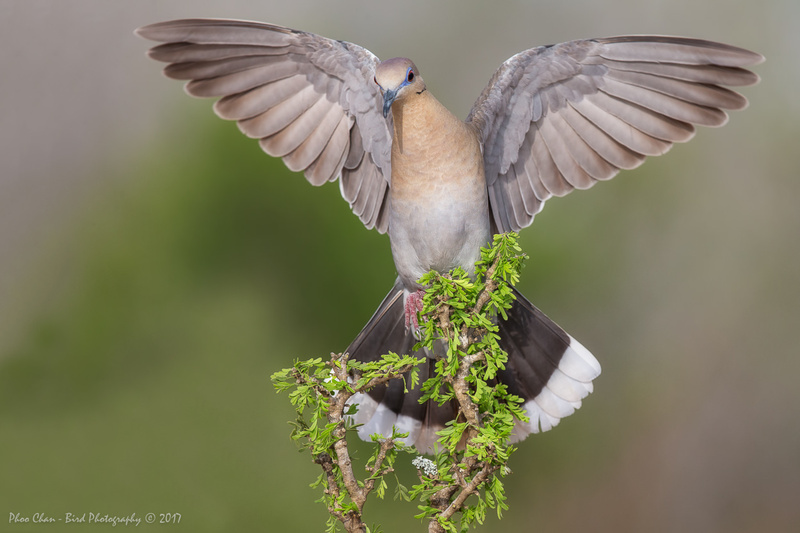 Sometimes you’ll not know what bird to shoot as there are so many that appear at once! I’m not gushing over this place because I got 7000 keepers. 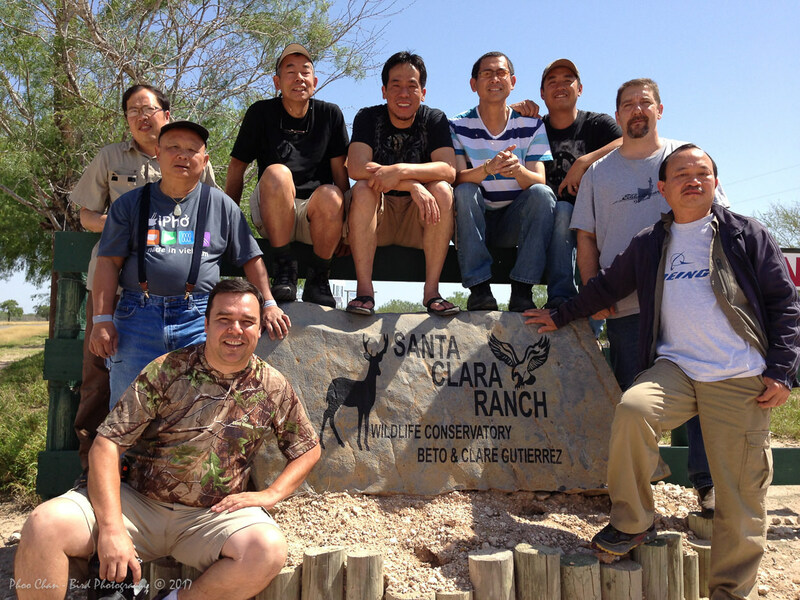 I truly enjoyed my stay, and enjoyed Hector Astorga (Ranch Manager) and Beto Gutierrez’s company. They are nice people who enjoy what they do and I highly recommend it to those who want shots like these. The 4-bedroom guest house was conveniently located right smack inside the ranch which could accommodate up to 8 visiting photographers very comfortably. So instead of having to drive 40 miles out to the nearest hotel, you can make full use of the facility especially if your group size is as big as ours. It has a fully equipped kitchen with built-in central heat and air condition. We really enjoyed the barbeque pit since we’re a bunch of meatatarians. After getting our rentals, we stopped at Costco (for those who are not familiar, this is the largest American membership-only warehouse club) which was not too far away from the airport we loaded our vans with 2 full shopping carts of food before we headed out to the ranch. Either we had underestimated our food consumption, or we’re a bunch of heavy eaters that we ran out of food for the last day we were there that we had to go hungry until we ate our dinner at the airport. It was around 4PM when we reached the ranch and we decided to start shooting the same day as soon as we unloaded our baggage from our vans. It was a rather heavy overcast day and we were loosing the the Harris Hawk hides and I wouldn’t mind shooting these raptors all day long but we have to take turns so that everyone gets their chance to shoot from all the hides. 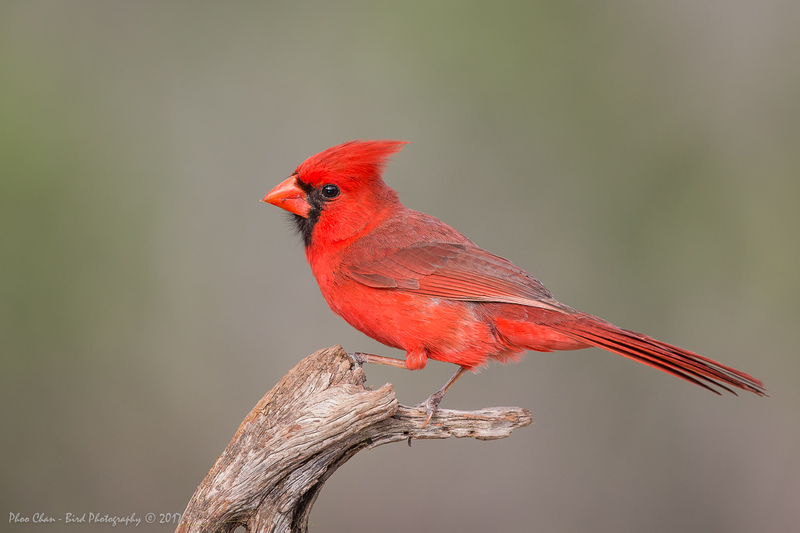 OK, let’s start with the angry bird – the Northern Cardinal. There were so many of them showing up everywhere that we filled-up our 32GB of CF card in no time. 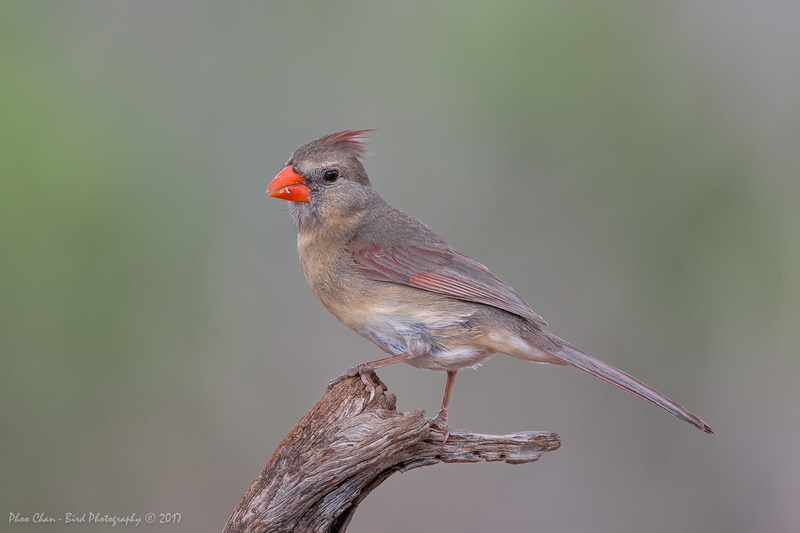 This bird along with the Pyrrhuloxia Cardinal are very common in South Texas but not for us from California, so we simply fired away despite such poor lighting. Most of the shots from our first day were deletes since we had much better lighting the following day but the excitement to see so many of them on the first day was so overwhelming. About half way the second day, everyone seemed to be so blase with the cardinals that we had to shoosh them off to make way for other birds to get closer. 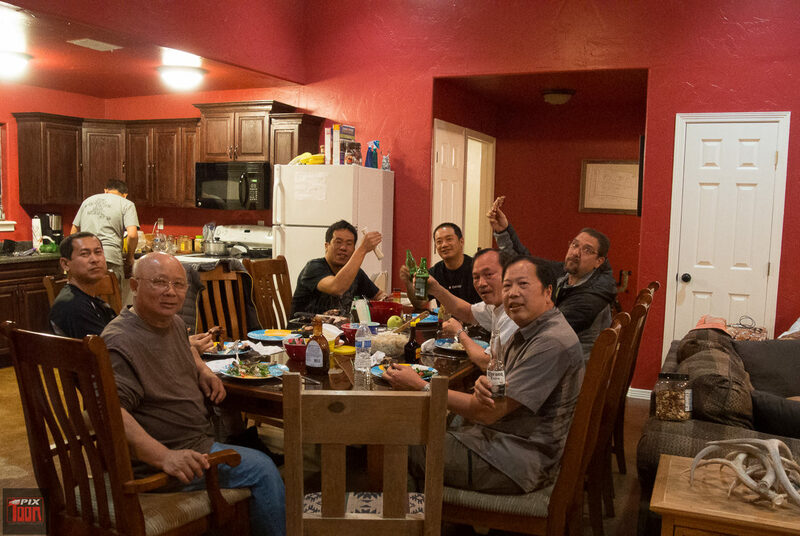 We had prime rib courtesy of our BBQ master chef, AnhTuan Truong. It was so delicious perhaps because we skipped our lunch on the first day as we just wanted to get to the ranch as soon as possible. 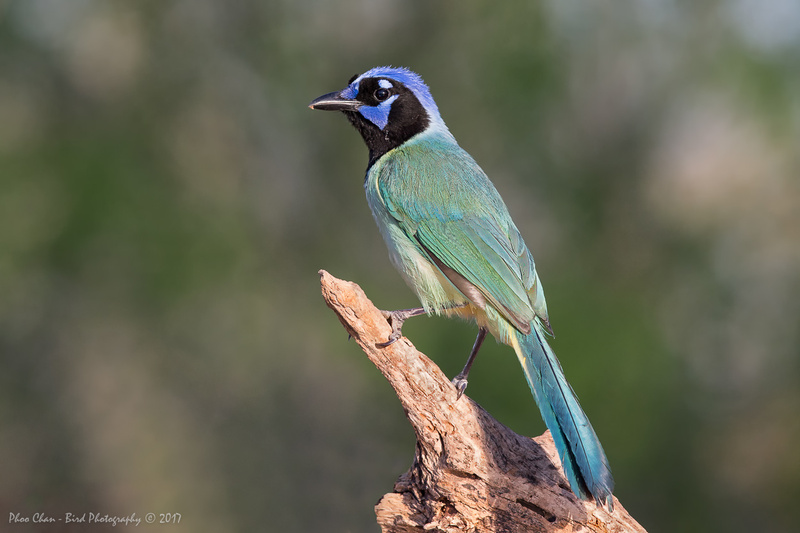 Another common bird that we don’t get to see in the Bay Area was the Green Jay which we would trade with our very common but not so pretty Scrub Jay or Blue Jay at anytime. Just take a look at the difference – such a beauty. 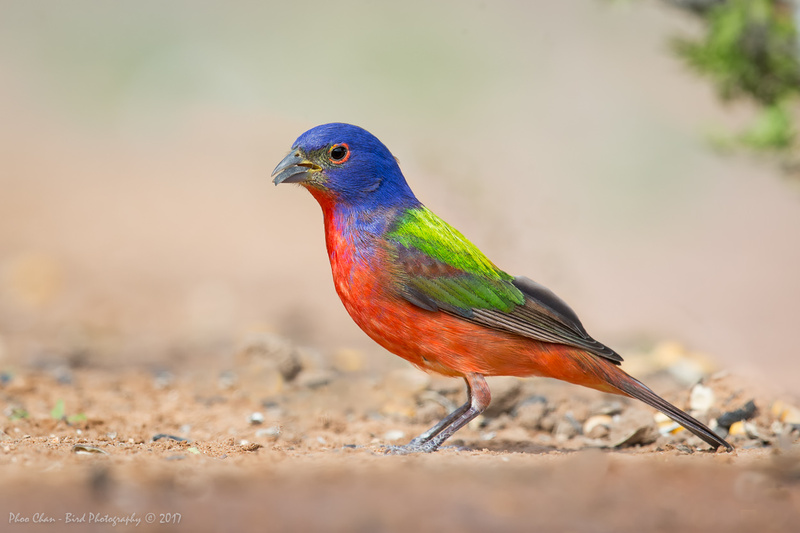 Without the need of any introductions, as the name itself tells you the Painted Bunting (Passerina Ciris) is such a colorful bird as if it just flown out of a child’s coloring book. 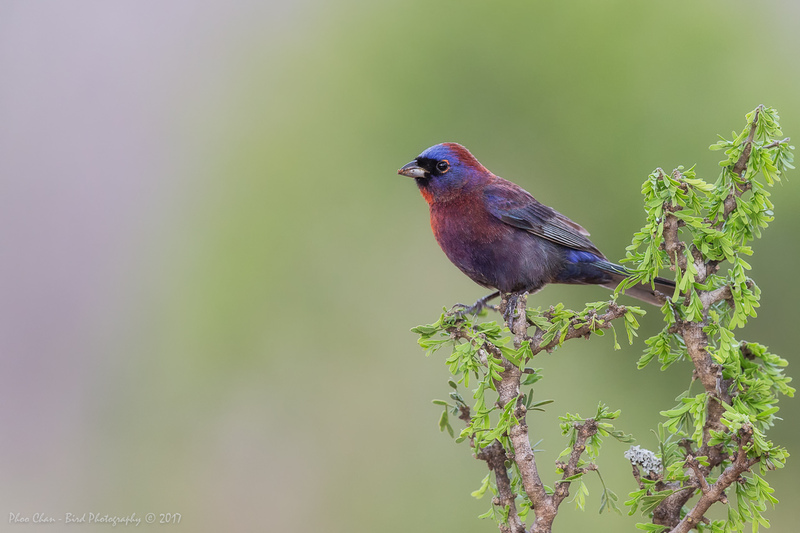 The male’s vivid fusion of blue, green, red, and yellow simply makes thel look so elegant. 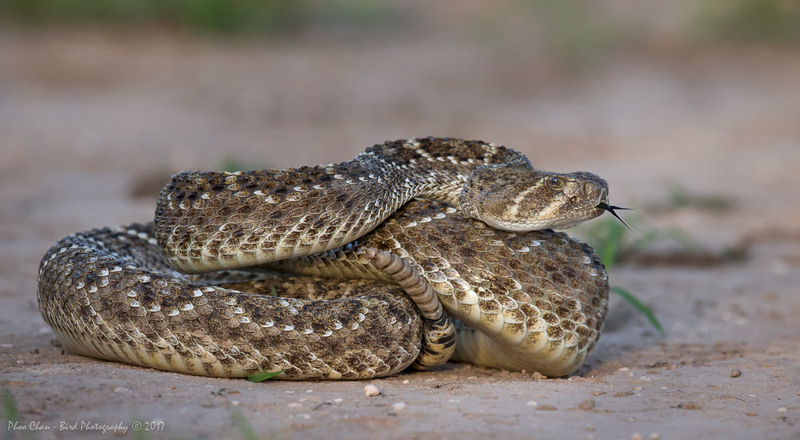 However, in contrast, the females and immatures have a distinctive bright green with pale eyering. 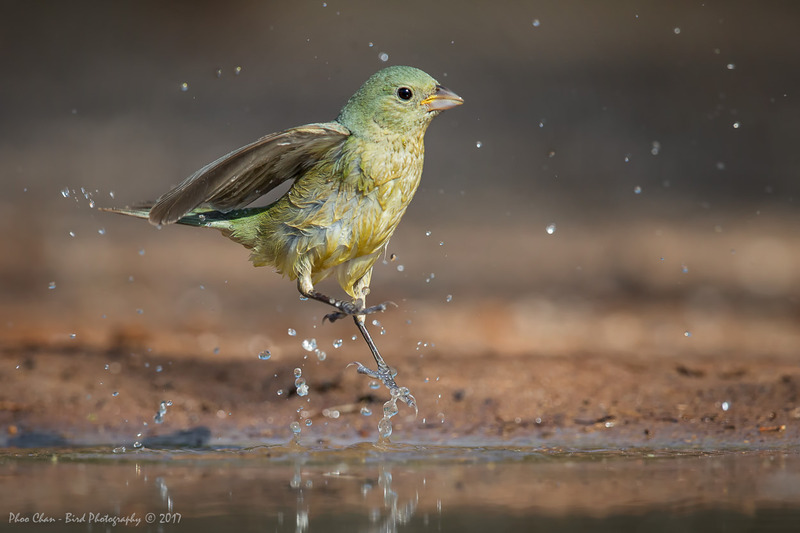 As the morning sun got warmer, they became active to cool down at the water pool. 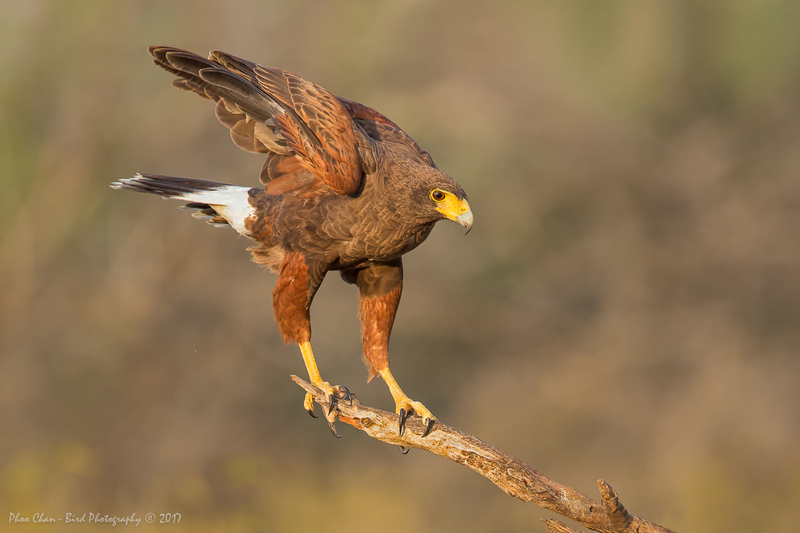 Perhaps the most interesting hides for me are the Crested Caracara and the Harris Hawk hides and I don’t mind shooting these raptors all day long but we have to take turn so that everyone gets their chance to shoot from all the hides. 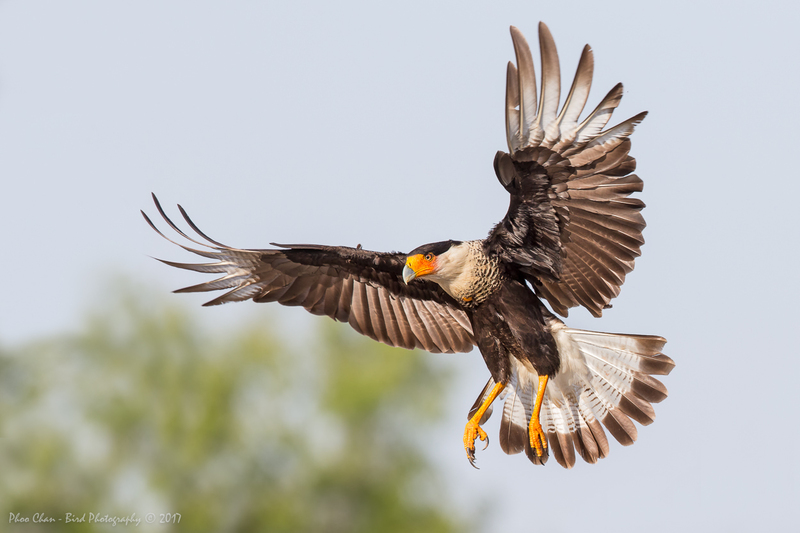 The Caracara is a tropical falcon version of a vulture. Like other vultures they scavenge for dead animals especially road kills by flying along highways. Often times they fly low taking small animals by surprise using this hunting technique. 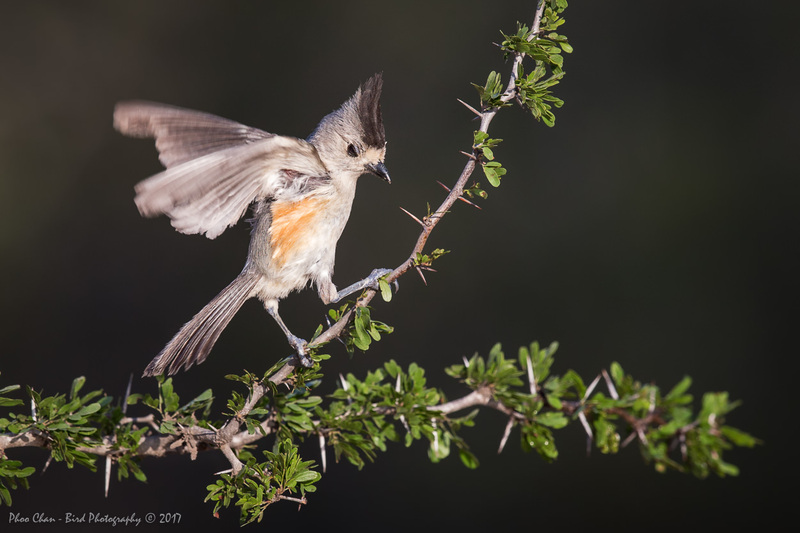 In courtship, two birds may toss heads back repeatedly while giving guttural call (source: audubon.org). The Harris Hawk pair did not seem to be obliging to us waiting in the hide. They only made a brief appearance but we simply seized very single opportunity presented to us. 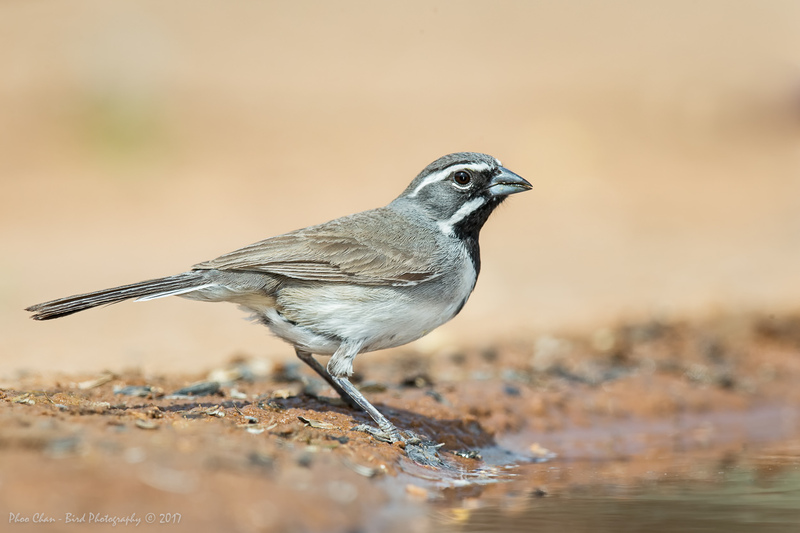 As usual, traveling with a group of your closest birding buddies has always been a blast and we plan to go back there again at a different time of the year perhaps for some different species of birds and critters. error: Alert: © Phoo Chan - Content is protected ! !